I was always hoping that Carney would come out on stage and open a book while announcing "I will now read from the Book of Alinsky" and all will be made perfectly clear." What a weird job. The only time he is of any use is when things go badly. THEN the obfuscation and glib explanations make him and whom he represents look like a card board cut-out farce. I haven't looked at the news today. Is this based on fact, or just the start of your Christmas wish list? 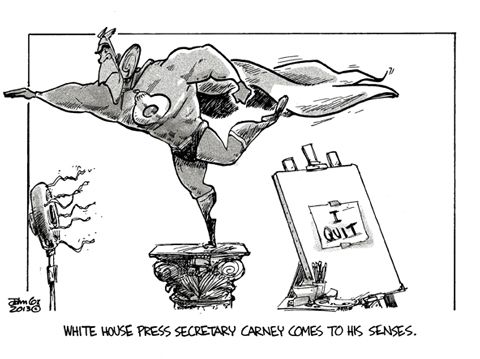 Just an odd idea of what Carney MIGHT do. "card board cut-out farce" is the best description I've seen for both Carney and his boss! Carney did take the day off today, here's a video press conference with a different dude on Brietbart. For lack of space, it's suppose to be the top half of the Capitol building, set atop an "O". May I suggest that Mr. Carney take a vow of silence and spend the rest of his days in a monastery. And his boss in a Federal Penitentiary. Boy does that conjure up some interesting imagery. pResident "O" must be wearing a muscle suit under those tights; he's nowhere near "ripped" as that. That's what I call irony. His self-image is indeed puffed up and artificial. This page contains a single entry from the blog posted on June 1, 2013 1:05 AM. The previous post in this blog was Party Like It's 1996. The next post in this blog is Momentary Zen.